Ever since moving to Florida a few years ago, we have been a beach family. We know how to pack for the beach, we know how to keep the kids entertained at the beach, and we know what to expect. But the mountains have been calling to me for quite some time, and I'm so glad I finally got the chance to go! The friendly folks at Visit Gatlinburg were kind enough to host my stay in their beautiful city, and I couldn't have been more excited. So many people, my parents included, recalled wonderful memories of the city lounging by the pool, exploring in the mountains, and shopping the day away. I wanted to see what all the fuss was about for myself! We drove 8 hours from home to stay in an Airbnb in northern Georgia with my family for a week, then took a detour to Gatlinburg for a few days before heading up to Wisconsin. (Usually, we drive all the way from Florida to Wisconsin in one sitting, so this was a welcome break. Here's how we survive the long road trip). 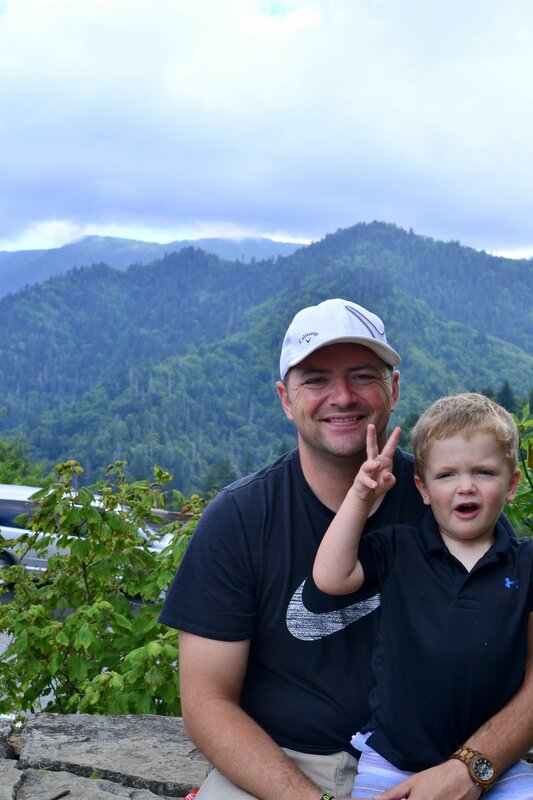 After taking copious notes and hundreds of pictures and videos, I'm here to share with you my family travel guide to Gatlinburg, Tennesee. There's SO MUCH to do with your kids, and I wish we had had a few more days to spend exploring. I guess I'll just have to go back sometime soon! Anakeesta is a new outdoor family adventure park where you could easily spend an entire day! We decided to check it out first thing in the morning, and I'm really glad we did! The crowds were significantly less right at opening time than they were later in the day, and the weather was a lot cooler. I would definitely recommend this strategy if you're heading there with young kids like us. Visitors to Anakeesta must take an aerial tram to the top, and there are two options. The first option is an open-air chair (like a ski-lift), and the second is an enclosed gondola. We tried both, and the gondola was great for my squirmy baby and toddler, as well as getting our stroller to the top of the mountain. My 5-year-old daughter loved riding in the open-air seats, too! The views are incredible during the ride to the top, but be aware it gets pretty warm and goes fairly slowly as people are getting on and off. Bring some water! There is so much to do at Anakeesta. My husband and I tried the dueling zip lines while my mom watched the kids and got them ice cream. Take note: if you plan to do the zip line, you need enclosed shoes. I was wearing my Tevas (I didn't even pack tennis shoes), so I had to switch shoes with my mom. I was really lucky she was there and we have the same size feet! Anyway, the zip line is a blast, and there are only three zips to do so it shouldn't take you too long. Kids are welcome and must be at least 7 years old AND 70 lbs to participate. We saw quite a few kids trying it, and while they were a bit nervous to start, by the end they were so excited and so glad they did it! You'll also want to wander through Firefly Village which contains a few restaurants and gift shops, as well as plenty of spots to sit and relax. There's a treehouse playground for little ones and a canopy walk that takes you right under the ziplines and offers a great view of the forest below. Honestly, Anakeesta was one of the highlights of our trip, and I might even need to do an entire blog post about it! Stay tuned for that. I wasn't sure at first if the Gatlinburg Space Needle was going to be toddler-friendly. We had a stroller along for our 1-year-old, and my 3-year-old can be fairly unpredictable. I was so pleasantly surprised by how doable this attraction was for little kids. The elevator that takes you to the top is enclosed glass and has plenty of room for a stroller. The observation deck is very spacious and wide, so kids can walk around and explore. The 360° panoramic view was absolutely stunning, and we all stayed up there for quite a while just marveling at God's beautiful creation. Definitely be prepared to take plenty of Instagram photos at the top of this attraction. This was one of our very first stops the afternoon we arrived, and I think it really helped us get oriented since we could see where everything in the city was. Listen. We've become sort of experts on aquariums. We've been to 4 in the past 2 months, so we know what we're talking about. That means you can trust me when I say that this aquarium was absolutely INCREDIBLE. I'll preface by saying that there are two levels to Ripley's Aquarium, a playground for kids, an entire penguin exhibit, and so many opportunities to interact with the animals. You could easily spend a few hours there. My three-year-old son was incredibly excited about Shark Lagoon, and he couldn't wait to walk through the underwater tunnel filled with sharks, sawfish, eels, tarpon, and turtles. He did have a little bit of a shock when a sand tiger shark swam right up to him and "smiled," sending my little Teddy running into my arms. I don't think he realized just how many teeth, and just how sharp of teeth sharks had. Despite that small incident, we loved the tunnel and spent so much time gaping at the giant sea creatures swimming above us. The other memorable portion of Ripley's Aquarium was the Penguin Playhouse. Kids could crawl through a tunnel to pop up to a window that looked right into the penguin's beach. Our kids went through that tunnel over and over until we finally had to lead them away. So fun for little ones. Definitely check this out. I cannot stress to you how cheesy I thought this was going to be. I only decided to give it a shot because we had some time to kill before the kids' bedtime, and we didn't want to be cooped up in the hotel room. But guys. GUYS. This was so much fun. I honestly think the grown-ups had more fun than the kids. The displays and trivia around the attraction are great, but even better are the interactive games where you can try to set world records in things like hula hooping, free throws, loudest scream (I'm assuming my children won), and lumberjack tree hack. Make sure to activate the card they give you if you want to participate in the games. We went about an hour before close, and it was perfect because there were no crowds and no lines for any of the games. 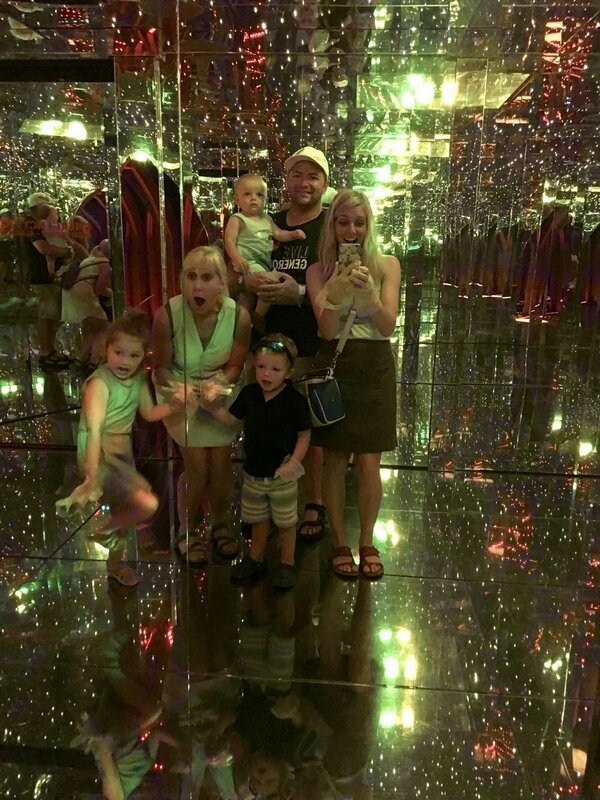 Mirror Maze : we had so much fun doing this! We let our 5-year-old lead the way, and she did great! Your stroller won't fit (if you have one), so just leave it outside. It only took a few minutes to do, but the whole family loved it. If you want to visit more than 1 Ripley's Attraction, I would suggest getting Combo Passes to save money. This was a fun experience. It was basically glow-in-the-dark mini golf with the option to use 3-D glasses. We had my mom walk around with the baby while we took the older 2 kids to mini golf. They loved it for the first few holes before our 3-year-old got a little scared. It does get pretty dark, and there are some circus displays that could be a little scary to small children, so keep that in mind. With children who are elementary school age, though, this would be a blast! Ok, this is only free or cheap depending on your spending habits, but you could easily walk around and browse through stores for hours. Sure, there are some kitschy souvenir shops, but there are also some really cute boutiques and stores to enjoy. I even picked up a few early stocking stuffers for the kids when they weren't looking. Make sure to find The Village Shops - it's tucked away off the main street, but feels like a haven from the hustle and bustle. I mean, this is a no-brainer. Gatlinburg is a gateway city to one of the most amazing and FREE national parks, so definitely take advantage of it! 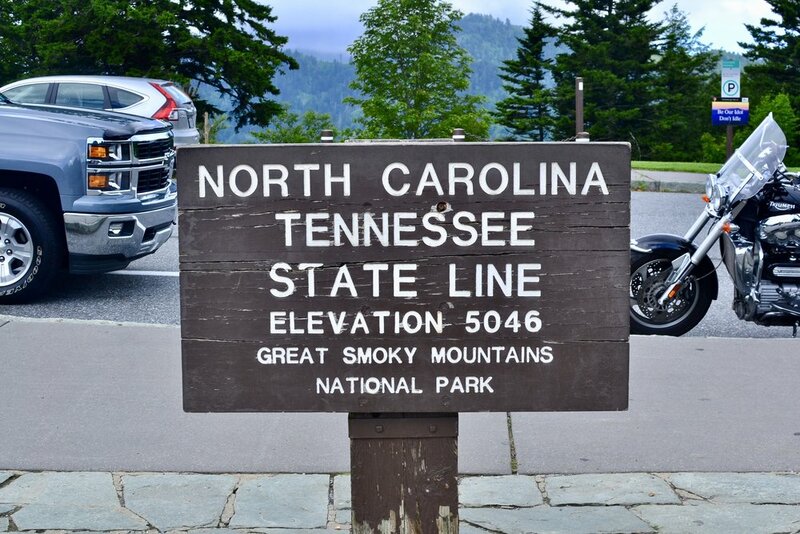 You can drive from the main parkway in Gatlinburg straight up the mountain into Great Smoky Mountain National Park. Take the road about 15 miles until you get to a parking lot with a lookout point. We enjoyed being able to walk around and enjoy the views with three little kids in tow. If you have more time, I would suggest looking into some easier hiking trails in the park. If your kids are a little older, I've heard Clingman's Dome is an amazing view. Ever since we took the trolley tour in Savannah, my kids have been obsessed with trolleys. We saw them driving up and down the main street the entire weekend we were there, so we finally gave in to their begging and bought some very cheap trolley tickets. (I believe they were either $1 or 50 cents). It was the perfect little ride up and down the main road in Gatlinburg, and it was nice to rest and enjoy the views. Perfect for kids and adults of any age. This only applies if you're visiting in June or July, but Tunes and Tales is simply free and fun entertainment in the form of sidewalk performers singing, dancing, playing instruments, and telling stories. This is what helped calm Teddy down after the mildly scary black light mini golf experience. It's a lovely little taste of Appalachian culture! So something you should know about us is that we are huge fans of packing a PB&J sandwich or an IsaLean Shake to save money (and eat a little healthier while on the road). We also made use of the continental breakfast at our hotel (more on that in a bit). So I'm definitely not the best resource for places to eat, but I do have a few suggestions for you. You must have dinner here where you're in Gatlinburg. The food was incredible, especially the garlic knots they bring each table before the meal. We went nice and early in the evening (embarrassingly I think it was like 4:30 p.m.), but we didn't have to wait for a table, and we had plenty of time to walk around and burn off the amazing Italian food we feasted on. We shared a few pizzas, and they were top-notch. Greasy? Yes. Cheesy? Yes. Delicious? You bet. You really can't go wrong eating here, especially with kids. What kind of family travel blogger would I be if I didn't find the best donut shop in the area? In Gatlinburg, that's The Donut Friar. It's the cutest little bakery, and they are known for their cinnamon bread. Don't forget to bring cash! They don't take cards. One of the nights we were in Gatlinburg, it began to rain, and we were getting hungry and tired, and couldn't decide where to eat for dinner. We happened to be right outside of Kilwin's Chocolates, and the scent of sweet ice cream and sugar came wafting out to us. We ducked inside and settled on ice cream for dinner. It was a great decision. There were so many incredible flavors to choose from, so everyone in your family will find something they love. We found the Greystone Lodge to be the perfect place to stay for families with young children. Its location is one of the main draws. Greystone Lodge is right across the street from Anakeesta and next to Ripley's Aquarium and the trolley stop. You would think being surrounded by so many of Gatlinburg's main attractions would make it noisy and crowded, but it somehow manages to feel tucked away from the craziness in its own cozy world. We loved that our balcony overlooked the river, and we enjoyed having a peaceful cup of coffee there before the day began. As I mentioned above, the Greystone Lodge offers complimentary continental breakfast, so eat up! We stayed in a family suite which had a dining table, kitchenette, and bunk beds for the kids, as well as a private room with a king size bed. It was the perfect size for our family, and we loved having room to spread out and relax. If you're looking for a little more privacy, you can stay in one of the Greystone Cottages about a mile away. More space, more privacy, and right on the Gatlinburg Trolley Route. So that's Gatlinburg! It's an amazing destination for families searching for a mountain getaway. I hope you love it as much as our family did! And follow along on social media! and grab your FREE road trip scavenger hunt for kids!